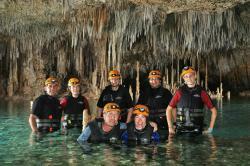 Tours from Amigo Tours tend to sell out - travelers recommend booking in advance! Thank you very much for your comments; we are sorry you didn't have the best experience with us. We offer an apology and assure you we're working to provide the best service for all our friends. We will consider your suggestions about the duration to improve our services. We were picked up at the sunset princess on time and from the onset we really like our guide. The bus didn’t have bells and whistles or a bathroom, but it was very clean and the air conditioning was very comfortable. We stopped at few times at washrooms that were clean and well stocked, and the stops were super quick. Our guide performed a very thorough and entertaining presentation to prepare us for the architecture and culture of Chichen Itza, then, we all had a siestas. On arrival you go through many workers selling hats for $4, then, after paying admission there’s another gauntlet of salespeople. Finally the tour to see the ancients site and it seemed to go by fast, we were in shade most of the time and it was all in English. Since they were being entertained the whole time by the guide, my kids never complained, which is surprising since it was 40 degrees Celsius in the shade. Our guides native tongue is Mayan but his English was perfect. On the way out of Chichen Itza the salesmen will sell high quality items for ridiculously low prices, it was almost free for some things but I’m not into sovereigns. We did lose someone from our group but we still left on time and somehow our guide found her and she met up with us at the next site. She was relieved to see her phone and personal belongings were kept safe on the bus. We went to the sink hole next, and there was 1.67 hours to eat and swim. The food wasn’t the greatest but it was included with the tour and a can of pop cost $3. You don’t have to rent a locker the driver kept our stuff safe. Life jackets are available for a fee and a life guard is in a boat near the swimmers. Coming out of the sinkhole, there are more sovereign shops but the prices were much higher the at Chichen Itza. Everyone was exhausted on the way home and it was hard not to sleep, the drive was smooth. At times I seen the driver drifting into the opposite lane, and back and I realized he knew every bump in the road. Thank you so much for your comments, we're glad to know you had a wonderful time with us. We work every day to provide the best service to all our clients because we love what we do. We hope you to come back soon. Our family of four booked a tour to Chichen-Itza through Amigo Tours online prior to arriving in Mexico and we were completely satisfied. 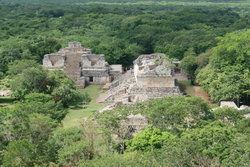 There are many options for tours that take all day (12-14 hours) but these tour options often include stops for breakfast, lunch or dinner that are in `tourist traps’ where if a guest is not careful they could spend much more than they budgeted for and not spend as much quality time at the archeological site as they hoped. We opted for the 4:40 am pick up time at the hotel, which sounds brutal, but as long as you lay off the tequila the night before, it is totally worth it. It is worth noting that if you are even 5 minutes late for the early pick-up, the van will leave you behind. Most hotel pick-ups are done by smaller vans that then take the small group to a pick up point about 45 minutes down the main highway, where those groups are loaded onto a much larger tour bus that travels to the Chitzen-Itza site. The total travel time from our hotel, to other hotels to pick up other tourists, and to the actual archeological site was over 2.5 hours. On the way up we stopped at a Mayan village about 25 minutes away from the site, where a Mayan shaman performed a ritual with incense and herbs to `bless’ us before we traveled to the sacred place. There was also a market with beautiful, authentic crafts and souvenirs that were certainly better quality than what we saw in town, and as is common in Mexico, bargaining will get a better deal. Once we arrived at the Chichen-Itza location, the value of getting up early was immediately apparent. Ours was the second large tour bus in the empty lot, and we were among the first tourists to arrive at the site, which is excellent for photography – the light is better in the early morning, and you can get great pictures of the ruins without 1,000 tourists standing in front of you. Remember that access to the actual structures is limited now, you cannot walk up the stairs or stand on the stones, but that is for preservation purposes. 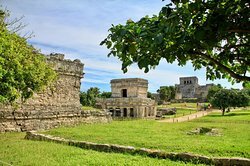 My son was particularly excited about the `sports stadium’ that the Mayans had, although he was happy he played soccer instead when the guide told us the winners of the ancient game would be beheaded – the highest honor to be achieved as a Mayan athlete. It was also interesting to see iguanas everywhere, claiming spots on top of the sacred stones and posing for pictures like they owned the place. 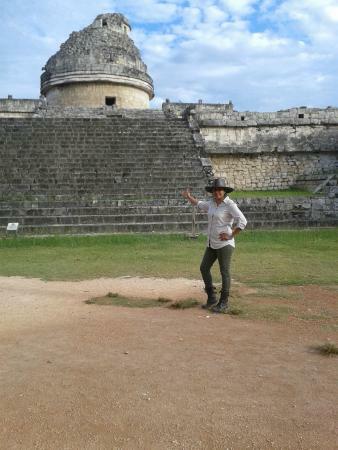 I must mention Marcos, our guide, who was an expert in Mayan mathematical knowledge, spoke some of the Mayan language and knew so much about the construction of the pyramids, structures and sports stadium. If you stand in certain spots in the courtyard below the pyramid and clap your hands, you can hear it perfectly resonate back, yet it is not an `echo’ – echoes repeat. However, stand in a different spot and clap your hands, and you hear nothing – only the guide could have shown our group that, we would never have known this detail without Marcos’ expertise. He explained the reasoning behind the number of steps, the number of levels, and the design of the snake’s back that only appears 4 times in shadows on the ground during the Winter, Spring, summer and Fall equinoxes. He also showed us how the Mayans designed the width of the sports stadium so that a sound on one side would echo 7 times exactly – how they were able to think of this and implement it through design is still a mystery. His knowledge certainly added to the value of this tour. We were allowed an hour to explore on our own after the tour, and as we left, we could see massive hordes of tourists in a line longer than Disneyland attractions waiting to enter the facility. As we saw the now packed parking lot stuffed with tour buses and the huge crowds, the value of getting up early was all the more obvious. Thanks to Marcos our guide and Carlos our driver for an awesome visitation experience of Chichen-Itza expertly done by Amigo Tours. Thank you so much for your comments, we are so glad to read about your experience in a very detailed and accurate review, we appreciate your kind words for our team in Cancún. We work every day to provide the best service to all our clients because we love what we do. Tony was our driver and Frank our guide. Both did nice jobs in their roles. It was great to arrive in the morning and it was still very hot (going up to 96 degrees the day we went). The heat is no joke. We were staying at the Westin Lagunamar and were picked up at 445. (Please note that the email they sent about where to be picked up (right outside the lobby) is not accurate - they were down a level nearer the gate led entrance). We had a long morning of pickups in a bus that holds about 50. By the time we got on the road to actually go to the site, it was almost full. This is a big tour! The stop en route for a Mayan blessing was a little interesting but mostly felt like a waste of time (we could have arrived 30 -45 min earlier to the site) and a ploy for you to buy things. We picked up lunch there - nice touch in that they offered veg option (cheese only sandwich - meal will sustain you but I’m glad we had nuts and bars we packed). Please also note there’s a new tax as of 2019 to get access to the site and there were problems with the credit card system Frank uses; finally got fixed after the tour but by then I’d gotten cash out of the ATM at Chichem Itza. I felt badly for Frank - not his fault at all and a real pain. Why not just include it in the initial coat when your reserve online? Guess maybe it makes the total cost look higher? Frank was very knowledgable and switched between English and Spanish with all that he shared en route to the site. Once there we joined another Amigos tour bus and then split our super large group into 2 by language. Our English group was as large a group as any (and much larger than many) at the site. Frank made it easy for all of us to follow along, finding shade as much as possible as we explored the ruins. Plenty of places to buy cold water and snacks. The vendors are all over the pace and a little overwhelming. Frank worked hard keeping everyone organized and sharing so much information. Recommend him but please know what you’re getting into in terms of really early morning, potential size of group. Oh and please note there are plenty of bathroom breaks, and you can safely leave things in the bus while you’re exploring Chichen Itza. Thank you so much for your comments, we're glad to know you had a wonderful time with us. We work every day to provide the best service to all our clients because we love what we do. We will consider your suggestions to improve our services. You will not regret booking this trip! If you're visiting Mexico this trip is a must! I highly recommend requesting Rodrigo as your tour guide. He was the consummate professional, highly knowledgeable and very passionate about his job. My friends and I were extremely grateful to have him as our tour guide. We learned so much more from him that we otherwise would have missed out on had we went with another tour group. We learned so much about the history, the ruins, the culture all thanks to Rodrigo. Antonio was a great driver, prompt and safe throughout. Amigo tours runs a great service and Rodrigo is a gem!! You will not regret it!